Turlington Page was born in 1889 into a large family who lived in Grimsbury, near Banbury, Oxfordshire. The family of 7 children moved with their parents, Thomas and Elizabeth Page to Bottesford sometime between the 1891 and the 1901 census. Thomas was born in South Newington, Oxfordshire. However Sarah (nee Miller) was from Nether Broughton in the Vale of Belvoir, about 12 mles from Bottesford. On moving to Bottesford they worked the Nottingham Road Nursery ‘growing fruit under glass’. Robert Turlington Noble Page’s names also give a clue to other local connections within the Vale of Belvoir. Two brothers, the Rev. John Gibson and the Rev. Robert Turlington Noble had connections with Nether Broughton where Sarah Page’s family came from. John Gibson Noble wrote a memoir of his brother, the missionary Robert Turlington Noble: “A Memoir of the Rev. Robert Turlington Noble: Missionary to the Telugu People in South India (http://books.google.co.uk. We are grateful for the Ian C Pearson for bringing this to our attention). We have not been able to establish any direct family connection between the Noble and Miller families but it is likely that Robert was named after the missionary Robert Turlington Noble. 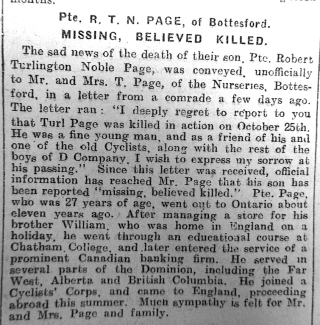 One other interesting connection with Bottesford was that the Rev. Robert Turlington Noble was ordained at the same time as the then rector of Bottesford Canon Frederic J. Norman. His letter of condolence on the death of Robert Turlington Noble from dysentery in October 1865 is reproduced in the memoir (p 66). The Page family established connections in Canada. 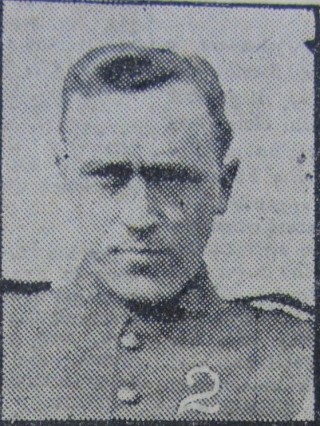 William Page, Turlington’s older brother had moved to Canada in 1902 four years prior to Turlington’s emigration in 1906. At the age of 17 Turlington Page was the first of the men from Bottesford to emigrate to Canada who would served with the Canadian Expeditionary Force. He sailed on the 3rd May 1906 on board the Allan Line ship the S.S. Tunisian, traveling on to St Thomas, Ontario, to join his brother William. The family were no strangers to transatlantic travel. William Page came back to Bottesford briefly in 1907 but sailed back with his wife Agnes (Miller) and their 2 eldest children on S.S. Lake Manitoba arriving on 20/10/1907 in Quebec. (We are most grateful to Anne Irons for this information). It also looks as if William visited England again in 1909 and returned with his mother, father and sister Sarah E. Page on the 20/8/1909 on the S.S. Virginian from Liverpool to Quebec/Montreal. Sarah is listed with Thomas (father) and Elizabeth (mother). The mother and father are also ‘stamped’ as’ Ret’d Canadians’ who are ‘touring’. The Bottesford School Logbook for 1909 records the resignation of Sarah Page as a teacher and her intention to go to Canada. William, Turlington’s brother and Agnes were living in the Dunwich, Elgin West area. William Page died in 1961. Most of the family, including Sarah are buried in the Tyrconnell United Church cemetery. Turlington Page would prosper in Canada. He furthered his education and over 9 years worked across Canada in the far West, British Columbia and finally as a bank clerk in Alberta. There he also established himself within the congregation of the Calgary Central Methodist Chapel. 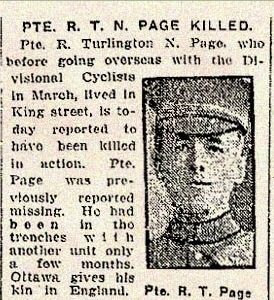 On his enlistment Turlington would name his bother William Page of Wallacetown, Ontario as the person to contact as his next of kin. Wallacetown is nearby to Tyrconnel and St Thomas close to the shore of Lake Erie. Turlington Page enlisted on the 19th August 1915 with the Divisional Cyclists 3rd Reinforcing Draft. He pre-war militia experience with 103rd Regiment of the Calgary Rifles would have marked him as someone eligible for specialist training with the Division of Cyclists. After initial training in Canada he underwent 9 months specialist training in Britain with the 4th Division of Canadian Cyclists. He would have taken courses in musketry, bombing, bayonet fighting and gas in addition to specialist training in signaling, range-finding, Lewis Gun use, and tactics. However, the static nature of trench warfare was not suited to the use of cycle mounted troops. Much to the disappointment of Cyclist Divisions troops, they were split up and sent as reinforcements to join other battalions. Only in the rapid advances of the last 100 days of the war would the Cyclist special skills come back into their own. (see Wendy Kimmel’s ‘Condensed History of the Canadian Corps Cyclist Battalion’). Turlington Page initially transferred to the 74th Battalion at Bramshott on the 9th June 1916. After a month he was then redeployed on the 18th July to the 44th Battalion. He proceeded with that Battalion to overseas service on the 10th August, arriving in France two days later on the 12th August 1916. After only 18 days in France he was evacuated from the ‘field’ and admitted to hospital with pleurisy. It would be a month before he was discharged back to the front to participate in the latter stages of the battle of the Somme with the 44th Battalion. It is not possible to judge whether his absence from the Battalion affected how he coped with conditions in the front line. He only survived 2 days on return to his unit and was reported missing in action believed killed during the disastrous Regina Trench attack by the 44th Battalion on the 25th October 1916. Battalion attempted to capture portion of the REGINA TRENCH under Operation Orders No.9. The Operation failed owing to insufficiency of Artillery Barrage. The Battalion suffered heavily. 3 officers; 7 injured; 1 shell shock; 37 Other ranks killed; 125 wounded; 13 missing believed killed; 13 missing . On that day the 44th Battalion lost 199 men to death or injury, one quarter of its strength. Edgar Russenholt provided a first hand account of that action in his history of the 44th Battalion, ‘6000 Canadian Men‘ published in 1932. “Zero hour” – 7 a.m. on the 25th. The 44th Companies move out in perfect order to the attack, Hardly have the men of the leading platoons stepped over the top when they are met by an appalling concentration of machine gun fire from the front flank – mowing down the waves as they come into the zone of fire. With terrific suddenness the enemy barrage bursts along the front, The entire area churns and spouts with bursting shells – as guns of all calibres pound the front endlessly. The supporting barrage is almost non-existent – a few guns only come into action (…) No words can describe the experience of the 44th men in this tragic action on Regina trench (…) Officers, NCOs and privates drop on all sides. No control is possible amid the noise and carnage. Suddenly the survivors realize that that something is wrong – the task is hopeless – no living man can reach the German line. Men drop into shell holes, some try to help their comrades who are hit, a few crawl back to their front line – to prepare for counter attack. I deeply regret to report to you that Turl Page was killed in action on October 25th. 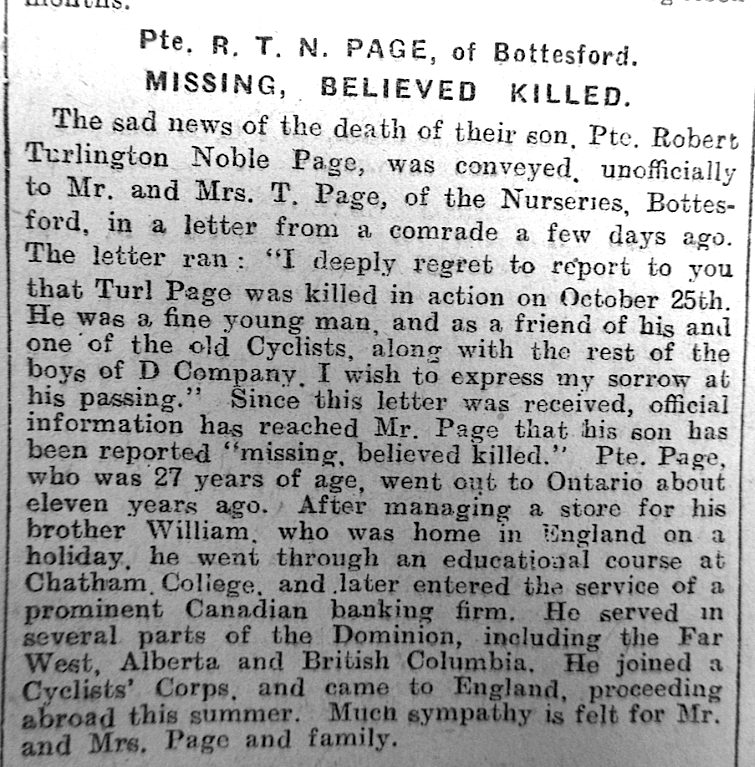 He was a fine young man and as a friend of his and one of the old Cyclists, along with the rest of the boys of D Company, I wish to express my sorrow at his passing. Turl Page’s remains were never recovered. 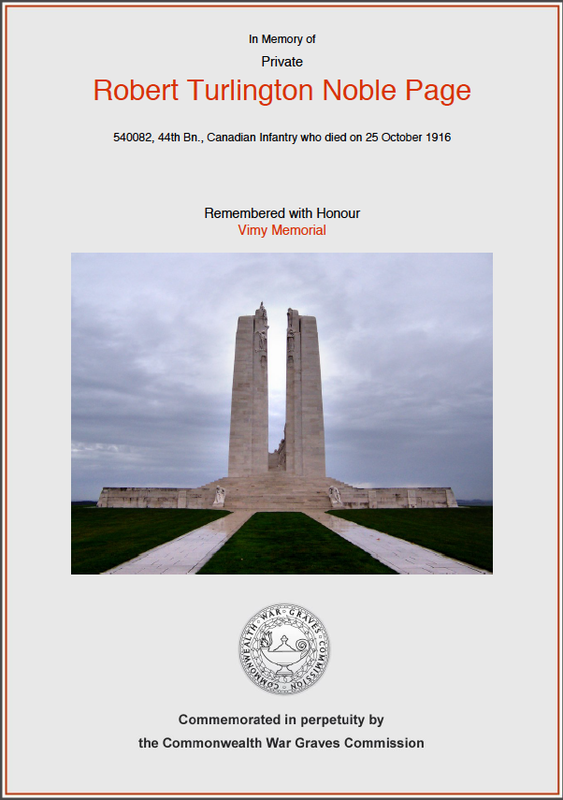 He is remembered on the Canadian the Vimy Ridge Memorial, one of the inscribed names of 11,168 missing Canadians, killed in action in France during the 1st World War. He is also remembered on Bottesford War Memorial and the Calgary Central Methodist Memorial .